Hermana Fausta Labrador (December 19, 1858 – December 13, 1942) is a Filipino Servant of God in pending cause for sainthood and is venerated in Roman Catholic Church. Her cause to be a servant of God is currently underway. She founded the Colegio del Sagrado Corazon de Jesus, a charity school for poor children that has evolved into what is now Sacred Heart College in Lucena City. 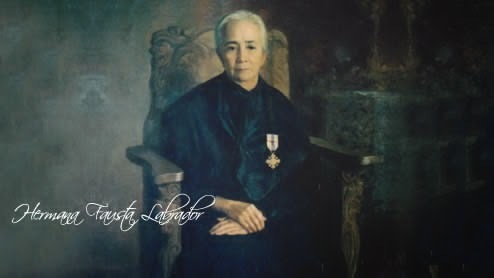 Hermana Fausta Labrador was born on December 19, 1858 in Tayabas, Quezon, to Nemesia Zarzadias. On December 22, 1858 she was baptized in St. Archangel church, Tayabas. On December 2, 1866 her mother died at age 27. Father had a second marriage to Maria Poblete. She has half-sisters Fe and Felisa. She started schooling in 1869. In 1879 she studied in Colegio de Santa Rosa de Manila. Fr. Granja visited them in the new house and counselled them to live in harmony. He gave Fausta "guidelines" regarding the house. Call all members of the new household, admonish them to live in the harmony. He imparted his paternal blessing with these words: "May the peace reign in this house." They all went to Church except the old Juan. From this day on the Rule of Life was: Hermana to get up at 3 AM everyday; her companions at 4 AM to pray together the Rosary and Trisagion. Afterwards companions remain to tidy the house. Hermana goes immediately to the church. Her companions follow her when the church bells ring for mass. Together they leave the church for breakfast. After which each to its respective chores while Hermana and Flaviana remain in the house. These consisted of: engage in sewing baptismal robes and burial clothes; make scapulars and artificial flowers to generate income to meet their daily needs; answer the call of the sick and help those in their last agony. May devotion in the church urging people to participate especially the young. Floral offering to the Blessed Virgin. Introduction of the Apostleship of Prayer all the town people were members. Gobernadorcillo Don Demetrio Trinidad issued an ordinance to gather the old people of both sexes living near the shores who had not gone to Confession for a long time and sorting them: the men to the courthouse (tribunal), the women to the house of Hermana Fausta to be instructed daily to receive the Sacrament of Confession and Communion." He started and continued every year the following devotion: on Quinquagesima Sunday (Domingo de Carnaval) to Ash Wednesday we gather in recollection in preparation of the outrages inflicted to the Heart of Jesus during these three days.Gather the "dalagas" (young woman) for Catechism lesson by order of Fr. Granja. They lived in this house. Fr. Granja provided for their upkeeping, food and clothing. To help him, I go from house to house begging. "Every night Hermana Tomasa, Cesarea and Escolastica come to this house followed by Fr. Granja who explains what we have taught our charges during the day. Many, although already well prepared, do not like to leave and they remain in this house." The Veneration Process of Hermana Fausta is now in underway to sainthood, but hasn't opened her cause yet by the Congregation for the Causes of Saints. She will be remembered as a hero in the City of Lucena. Ghasibe Kayrouz: "I have only one request, forgive those who killed me"
Amador Tajanglangit: "True Son of the Lady"
Lucien Botovasoa: "My God, Forgive These Brothers"